Cured and often smoked strips of meat and fat taken from the belly wall of a pig. The meat is most often served at breakfast, though the fat, rendered from the meat, can be used as a flavorful cooking fat for any savory dish. Italian pancetta is a non-smoked salt and black pepper cured bacon, and is used as the cooking fat in many italian dishes. Quite possibly the most popular cured/smoked meat in the world. Bacon is fatty, with long layers of fat running parallel to the rind. Pancetta is Italian bacon, smoked or unsmoked, with a strong flavor. It is generally rolled up into cylinders after curing. Colors: white with streaks of pink to dark red and a slightly brown rind. Choosing: American bacon shrinks considerably when cooked, as the heat releases much of its high fat content. When purchasing, be aware that a pound of bacon will shrink to about 4 ounces (112g). Buying: You can buy bacon on your supermarkets but its best to buy bacon on butcher shop or downtown meat store. 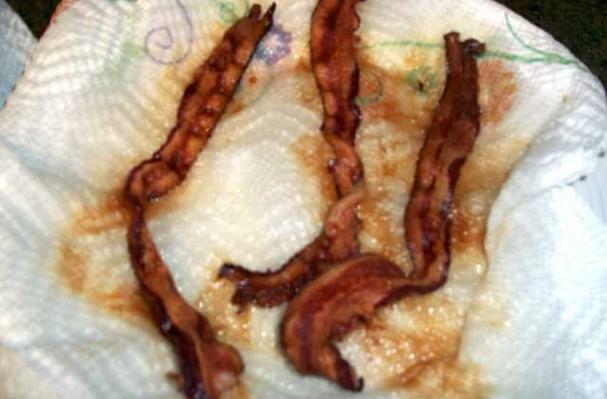 Bacon is traditionally served in breakfast. But now as different chef comes, they are bending the tradition a little and serve bacon in new dishes. Sometimes bacon is used as filler recipe or side dish. When purchasing, look for bacon with the meat running the full length of the slices or slab. Store bacon in the refrigerator. Vacuum-packed bacon, once opened, will keep in the refrigerator for one week. If tightly wrapped, slab bacon keeps for several weeks in the refrigerator. Slabs of Canadian bacon keep for up to a week, but slices must be used within three to four days. Bacon will keep in the freezer for one to two months. You are probably familiar with the phrase "bring home the bacon." In the twelfth century, a church in the English town of Dunmow promised a side of bacon to any married man who could swear before the congregation and God that he had not quarreled with his wife for a year and a day. A husband who could bring home the bacon was held in high esteem by the community for his forebearance. In this health-conscious day and age, you would think that bacon would be low on the list of preferred foods due to its fat content. Yet, as anyone who dabbles in pork belly commodities can tell you, bacon is solely responsible for giving a boost to the pork market. Bacon has become so popular as a sandwich ingredient and a favorite of chefs in fine dining establishments that bacon shortages have caused prices to soar. However, bacon is still a bargain that can't be beat when it comes to adding flavor. With low-sodium and lean varieties available, even the dieter can partake in moderation. History: Until well into the sixteenth century, bacon or bacoun was a Middle English term used to refer to all pork in general. The term bacon comes from various Germanic and French dialects. It derives from the French bako, Common Germanic bakkon and Old Teutonic backe, all of which refer to the back. There are breeds of pigs particularly grown for bacon, notably the Yorkshire and Tamworth. In England, a side of bacon is called a gammon, and a slice of bacon is known as a rasher. Seventy percent of the bacon in America is consumed at the breakfast table. OMG. BACON! The love of my life!